Printable Checklist for the perfect Summer Picnic! What’s Summer without a picnic? Perfect weather, good food, even better company, laughs and just good times all round. If you’re planning a Summer Picnic, make it the best one your guests have ever been to. Impress with the best selection of food and entertain the right way with the best mixture of activities and drinks. Bring out your creative side! Picnics are the best chance to catch up with your nearest and dearest – whether that be your girl gang or your grandparents! There’s a tonne of choices that you can make to throw the perfect picnic to cater for everyone! So where do you start? Ya girl has always got you covered. Here’s a printable checklist for the perfect Summer picnic. Just click on the image below, then right click and save it to your computer. EASY AZ. You can tweak this list as much as you want! Add the things you love to bring to a picnic! Pinterest is always a good place to browse for inspiration. It’s packed full of food and drink suggestions and ways you can glam up any Picnic party. Have a peak at the Gold Soul store to see what you’ll be wearing to your perfect Summer Picnic. A cute romper? Bug-eyed sunnies? A flirty dress? 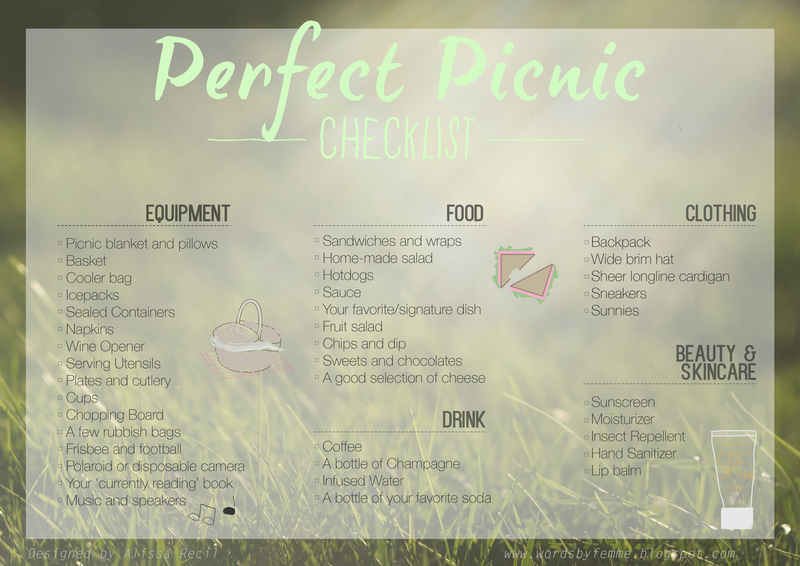 Author wordsbyfemmePosted on July 14, 2015 July 13, 2015 Categories FOODTags Checklist, Design, Drinks, Food, friends, fun, Lifestyle, Lists, Picnic, Pinterest, Printable, Summer, TravelLeave a comment on Printable Checklist for the perfect Summer Picnic!